Miss Narvekar feels that MOOCs become a mutual learning experience involving diverse student community with varied intellectual capabilities. “A lot of times, students come up with content suggestions for our course, which we may have missed. MOOCs offer a great advantage to all participants, especially in such creative design courses where students come up with innovative ideas, and share the same with the entire cluster. We encourage such participation from students which results in productive learning,” adds Miss Narvekar. MOOCs have their own share of challenges. It is upon the MOOC providers and instructors to understand these limitations, and work accordingly. Miss Narvekar says that the scalability, one of the key advantages of MOOCs, can sometimes become a challenge for creative courses, in terms of evaluation. Their assessment gets limited to their theoretical knowledge base (objective questionnaire) as it becomes impossible to evaluate such a large number of students on their attained practical knowledge (projects). Another well-known downside of MOOCs is the missing interaction between students and faculty. “Since we lack the regular face-to-face interactions, instructors need to evaluate and balance the course content. While some students find it difficult to absorb the content, others may find it relaxing. To make our course effective to a larger audience, prior to course release, we beta tested the sessions from students’ point of view, and incorporated the changes suggested by these students. Additionally, it is our responsibility to make our course stimulating. 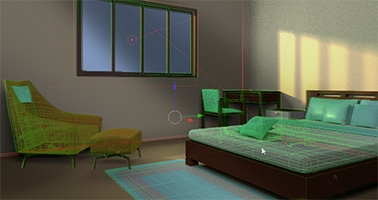 In order to make things interesting in our MOOC, we presented the final visual goal (a bedroom interior) of the course in the first session, and then every lecture was a step closer to that. This worked very well for us,” says Miss Narvekar. "One of the greatest advantages of MOOCs learning is that it greets students without any eligibility restrictions." IITBombayX envisions MOOCs to become an integral part of online learning and education in future. Miss Narvekar strongly agrees with this view, and feels that online courses are more customized to the needs of students today. “Architecture students are more inclined towards practical visualization than the theoretical aspect of teaching. Such courses are rarely a part of course curriculum in universities, or may be offered as elective courses in a few universities. Students interested in the same have to seek external institutes, which are dominated by selective and expensive visualization software. Online learning, such as MOOCs, makes such exceptional courses easily accessible to anxious and eager learners. However, it is critical to create awareness at higher education institutions, through seminars and workshops, to incorporate such programs as elective courses in their curriculum,” told Miss Narvekar. The key focus of IITBombayX MOOCs is to employ digital solutions to widen access to educational and skill development opportunities for learners, especially those who unable to avail quality training due to financial or personal reasons. Hence, MOOCs is a digital provision in India for improvement in higher education, where learners and MOOC providers should work together towards its enhancement.